Whatever the occasion, birthday parties, festivals, fundraisers/charity events You can be sure our Inflatable Football Pitch/Hub will add fun to your event! 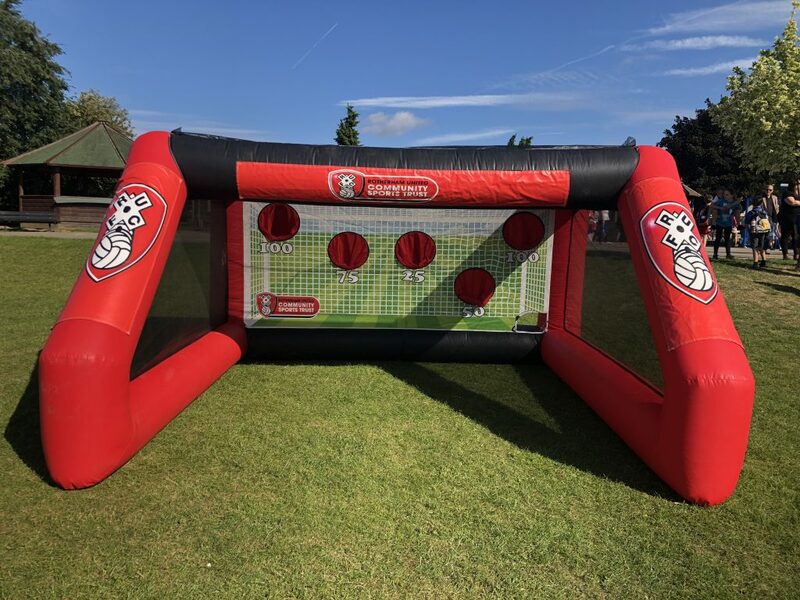 The hub is a 5M x 6M inflatable that we advise a minimum playing area of 10M x 15M to allow participants room to take a range of shots at the target surface with a number of target holes in to test the best of players. Can also be used for a penalty shootout or at charity events. The pitch is a 20M x 12M inflatable that requires a 22M x 15M playing area. The pitch is great for small sided games to keep the ball contained within for maximum playing time during matches. The goal is 8ft x 10ft, The goal is great for parties or festivals/events where everyone can take part. The goal could also be accompanied with a speed test reader. If you would like to enquire about hiring our inflatable Football Pitch/Hub please complete the contact form below.